HALIFAX -- A Nova Scotia judge has granted a temporary injunction to stop fishermen from blocking survey boats hired to examine a route for a pulp mill's effluent pipeline. Nova Scotia Supreme Court Justice Denise Boudreau decided the fishermen have the right to "lawful protest," but they don't have the legal right to block the survey vessels from doing their work. Lawyers for the Northern Pulp mill in northern Nova Scotia argued that their project was being unlawfully held back by the fishermen's blockades. 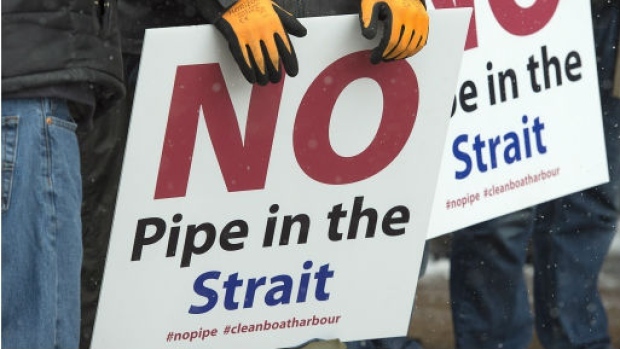 Before the decision was handed down, about 80 people gathered outside the Halifax courthouse to protest the proposed pipeline that would pump treated waste directly into the Northumberland Strait near Abercrombie,N.S. The plan has raised the ire of fishermen, the P.E.I. government and even Hollywood actor Ellen Page, who is from Halifax. The Nova Scotia government has committed to stopping the flow of effluent to the heavily polluted Boat Harbour lagoon by Jan. 31, 2020. The lagoon is next to the Pictou Landing First Nation.